YOUR HORSE NEEDS A VACATION TOO! Leatherwood Mountains Premier Equine Facility is a wonderful destination horseback riding vacation for you and your horses. There are over 75 miles of beautiful NC trails to explore that consist of long woodsy paths along beautiful ridges, old logging roads, lots of creek crossings and minimal to long climbs and descents. The trails are safe, well marked and mapped. When you and your equine companion visit the heart of “Horse Country” you may never want to leave! 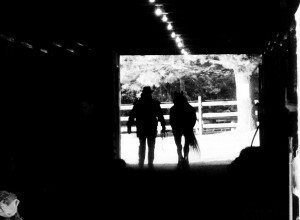 Equine Center & Front Entrance Map $25 per stall per night – includes 1 bag of shavings, you can purchase additional bags when you are here for $6 RENT 6 NIGHTS & GET THE 7th NIGHT FREE!!! Dogs must be on a leash at all times – no loose dogs allowed on trails. Health certificate recommended if coming from out of state – Check state requirements when crossing state lines. TRAIL BARN – 10 open air/covered Trail Barn stalls – located across Elk Creek (over a high water bridge) – 5 hook up camping sites. The sites at the Trail barn are ONLY 20 Amp breaker sites. You also must bring at least 100′ of drop cord & water hose with you when you camp here as all the hookups are from 1 panel location. Contact us at stables@leatherwoodmountains.com or 336.973.5044.